All eyes are on Captain Marvel coming out of Avengers: Infinity War, but there seems to be some confusion about her title, and we're here to clear things up. If you happen to take a look online you'll see some confusion regarding the title of Captain Marvel. That's because the name has a rather interesting and convoluted history, and it all boils down to three separate characters who go by Captain Marvel, Mar-Vell, and Shazam!. All three are different, so you might not see the issue, but if you type Captain Marvel into Google you'll soon see how the three intersect. Google also throws in Captain America regarding that search, but that's a whole other issue. For now, we'll just get to the main three. The character who is showing up in the MCU goes by the name of Captain Marvel, otherwise known as Carol Danvers. Brie Larson is playing her in the film, but in the comics, the character wasn't actually called Captain Marvel until fairly recently (at least in comic years). Danvers originally went by Ms. Marvel as an homage to the one who gave Danvers her powers, who happened to be a Kree warrior named Mar-Vell. 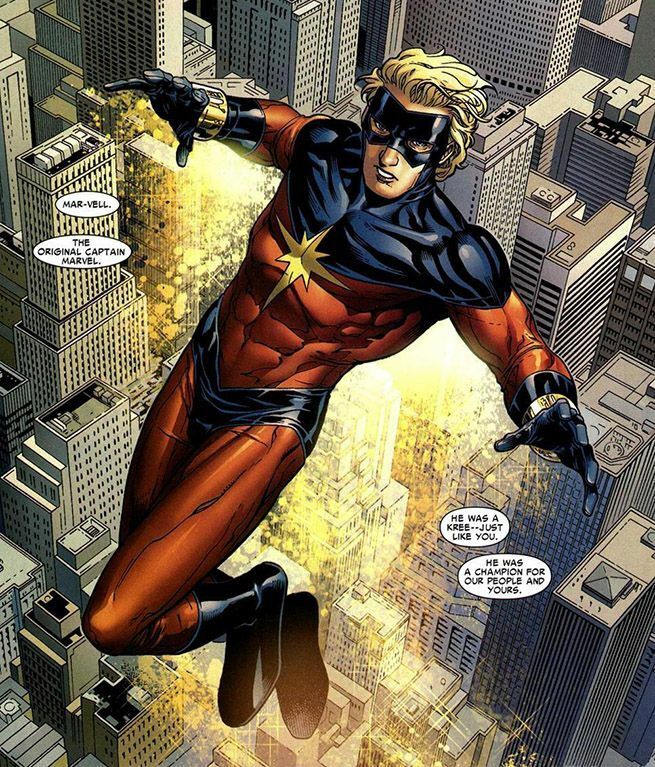 Mar-Vell ended up as part of a task force who were sent by the Kree to spy on Earth. Unfortunately, he happened to be under the command of Colonel Yon-Rogg, whose jealousy put a target on Mar-Vell's back. After an assassination attempt gone wrong, Mar-Vell ended up saving innocent bystanders from a Kree Sentry. The grateful citizens misheard his name of Mar-Vell, and thus called him Captain Marvel from that point on. So, Mar-Vell was the first to use the name, but during his adventures, he saved Carol Danvers from Yon-Rogg, who was still pissed and jealous mind you. He shielded her from the blast of the Psyche-Magnitron, and while he did protect her, she also ended up absorbing some of his genetic makeup, thus changing her DNA and granting her powers. So, you can see why she adopted the Ms. Marvel name. Unfortunately for Mar-Vell, his previous exposure to a lethal gas called Compound 13 ended up giving him cancer, as he had direct contact with it. His Nega-bands were able to slow the effects, but he eventually crossed over to the afterlife seven years later. That brings us back to Carol Danvers, who still went by Ms. Marvel for the majority of her career. It would be Captain America and the words of her late friend Helen Cobb who would help convince her to accept the mantle of Captain Marvel, and she finally did. So, Mar-Vell is the first to hold the mantle, and Carol is the second, but who is DC's Captain Marvel? Well, these days he goes by Shazam!, but this one can be a bit confusing. The original copyright holder of the name Captain Marvel used to be Fawcett Publications, who came up with a Superman-type character named Captain Marvel. The character's real name was Billy Batson, a young boy who was given the power of the Gods by the Wizard Shazam. When Billy transformed into a hero, he would be called Captain Marvel, and also had a twin sister who became Mary Marvel and a friend who became Captain Marvel Jr.
To make a long story short, Fawcett eventually stopped publishing Captain Marvel in 1953 and later stopped its comics business completely. The character would get new life when DC Comics licensed the character from Fawcett in 1972. Thing is, during that time of inactivity Marvel Comics had copyrighted the name Captain Marvel for Mar-Vell, so DC could use the character but couldn't actually call the book or the character Captain Marvel. They decided to go with Shazam!, that being Billy Batson's magic word to transform into a hero as well as the name of the Wizard. They would still reference the Marvel family in the books of course, but they couldn't officially use the title any longer. So that's it. If you see a male Captain Marvel with red and blue he's Mar-Vell. 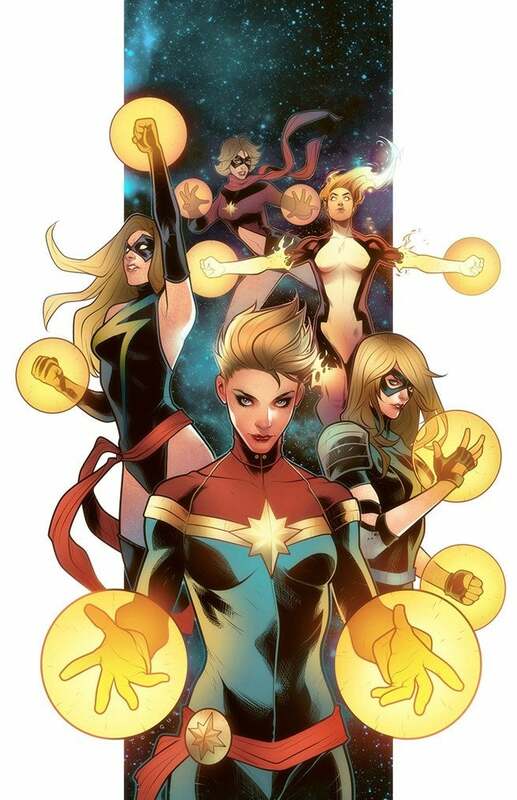 If you see a female Captain Marvel it is Carol Danvers. 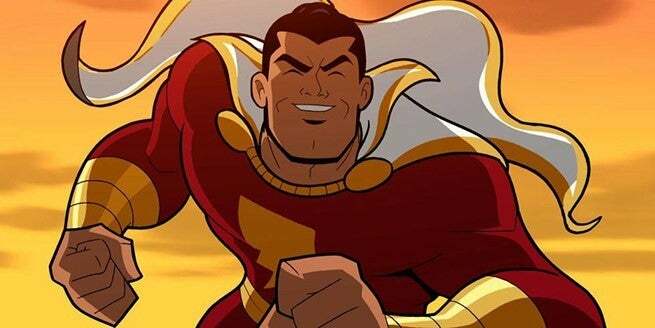 If you see a male Captain Marvel in red and gold it is Shazam!. Hopefully, this helps clear things up at least a little bit. You can find out more about Captain Marvel here.